Kellys are a home grown bike brand from Slovakia and are now reaching Australian shores courtesy of new Aussie distributor, Ride Sports. They’re a brand who have been around for a long time, but haven’t been something that we’ve seen on our shores. The team at Ride Sports was super keen for us to check out their downhill bike, the Noid and see how it performed. The first thing we noticed on receiving the bike is how good it looks, the 7005 Aluminium frame has clean welds and a good looking gloss neon orange and black colour scheme, along with all black components. Familiar stoppers and drivetrain from the Shimano Zee range provide the braking and power duties, Rockshox provide the suspension with a Boxxer RC up front and Super Deluxe Coil out back. It’s a fantastic looking bike and definitely warranted a lot of attention down at the bottom of the Thredbo chairlifts for opening weekend. Even some big name Aussie downhillers commented on how good it looked to us! The second thing we noticed was the suspension design. Looking from the drive side of the bike you’d think this was a linkage-driven single-pivot design but you’d be wrong unless you looked at the other side. A lower link at the bottom of the solid rear triangle, connected under the BB, allows the rear suspension to track across a virtual pivot point which the team at Kelly’s say should isolate the rear from braking and pedaling forces. Until we got it out on the trail, we just had to take their word for that. The lower link here bridging between the BB and rear triangle. A mud guard is also good to see! Along with the suspension design the rear end also has adjustable geometry. The Vario-Geometry system as they call it, allows the shock mount collars to be flipped, raising or lowering the bottom bracket by approximately 10mm, and the axle mounts at the rear allow the chainstays to grow by 20mm off the standard 422mm chainstay length. 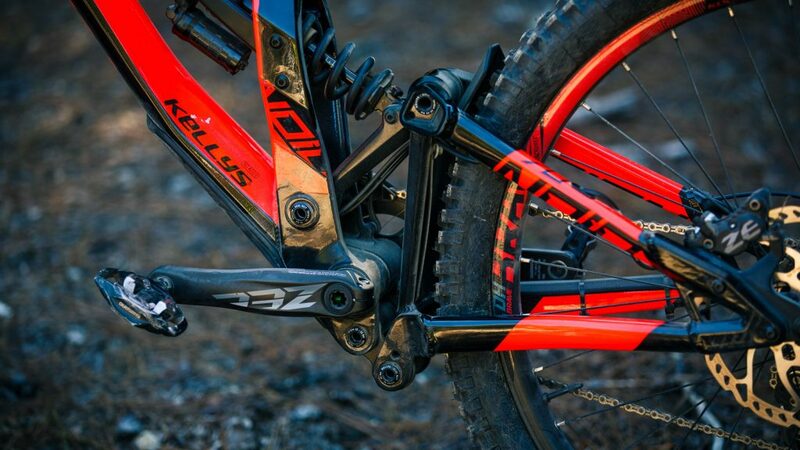 At 422mm in the short setting the bike has a very playful short rear end, it may just be the shortest chainstay length on a downhill bike available here in Australia at all! Even the big “S” brand downhill bike, famous for its short rear end, has a longer rear end. And if short chainstays aren’t your thing you can just unbolt the rear axle, undo the bolts on the axle mounts and slide it back into the longer setting to take it into more familiar territory at 442mm. All the geometry-adjusting bolts just require a set of allen keys to undo and a few minutes time ( A little blue loctite on the threads when re-installing is also a good idea ). But anyway, enough tech stuff for now. How did it ride? I’ve got access to a little track which is perfect for shuttle runs and has a decent mix of high-speed sections, corners, jumps and rock gardens. A short run but most here in Australia are like that, aren’t they. First of all, we tried the bike in the high-bottom bracket, short chainstay setting. From the very first corner the grin on my face was real, the short rear end and snappy geometry just begged to be left wide open and leant into corners. Every bump in the trail became an opportunity to pop over and get airborne, it’s a very active bike. When the time came to slow down the 4-piston Zee stoppers did it with minimum fuss, and the rear end remained really composed and active under braking as well. I guess that rear suspension design does actually work as intended! Pedaling out of corners there was only the very slightest bob and I never felt any noticeable pedal kickback over rough sections. The active feel of the rear suspension made this a bike that just wanted to be pushed fast, combined with the lively pop off of jumps made this one fun bike. Fast forward a couple of weeks and the real test would come, the Thredbo downhill track. Before going I swapped over the geometry to the low BB setting and left the chainstay length short. Down the Thredbo fire road the suspension did a great job of soaking up all those freshly-cut water bars and through the top sections of Thredbo every little jump became an opportunity for air time. In the tighter sections down lower in the course, the bike had no trouble threading through the tight sections, the relatively short top tube & reach made for an easy to maneuver bike. Rounding out the package, it comes with house brand KLS rims laced to Novatec hubs, the Novatec hubs are quiet and dependable, with a Race Face alloy stem, 35mm clamp handlebar and seatpost and a KLS brand saddle. Schwalbe Magic Mary 2.4 Addix tubeless-ready tyres keep the bike in contact with the ground, these are a good choice for most conditions but tyre choice is very much a personal choice and it wouldn’t be overly expensive to swap out to your preferred tyres if the MM’s weren’t your thing. Similarly with the rims these are tubeless-compatible with 23mm internal width, which is narrower than some other popular rims, if wider rims are your thing this would be an easy change for your local bike shop to rebuild, keeping the Novatec hubs and spokes depending on the rim selection. The bike uses internal cable routing and has some neat integrated bump stopper/cable guides where the cables go into the frame, the downtube bottom protector is removable to allow easy access to the internal cables when building it up or replacing cables/hoses. The Noid 70 also has a big brother, the Noid 90. Upgrades on the 90 include a Boxxer World Cup, Saint brakes, crankset and derailleur. For 2019 the Noid 90 is also available in a 29″ wheel size. 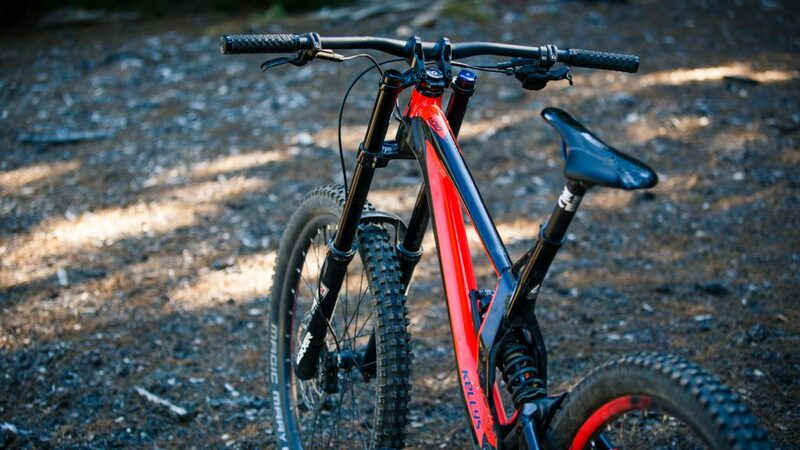 Changes from the 27.5 to 29 aren’t big – a 29er fork and a new set of rear axle plates that put the axle out further and higher than on the 27.5 but still keep the variable length, however it’s only available as an L size frame. 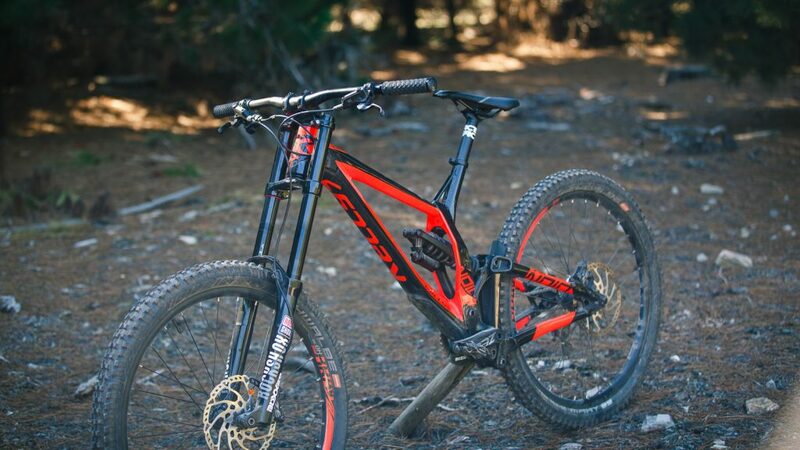 Also for 2019 the 27.5 versions of the bike are available in an XL size, those of you who are taller than 6’4″ or would prefer a longer bike could always go up a size. At just on 6 foot riding a Large size I felt this was comfortable and maneuverable but if given the chance I’d definitely sit on an XL size to see if it suits better. 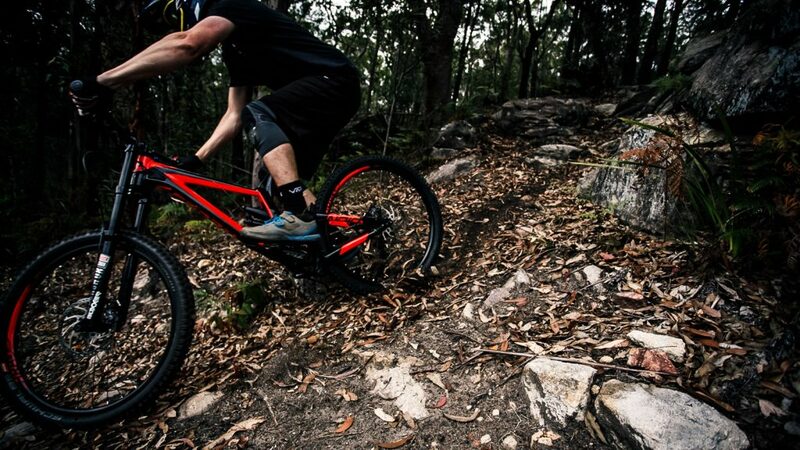 Overall at the pricepoint of $5099 RRP, we reckon this is a great package for a mid-level downhill bike, and it’s good to have more options in the downhill bike market here in Australia! Integrated fork bumpers also provide the entry for internal routing. The cables exit here above the BB and into the seatstays. Gear cable routing, also the end caps for adjusting chainstays are here. The shock top mount link that varies the BB height. The bolts on the left are swapped. The Noid 70 and Kelly’s range was provided by the distributor, Ride Sports. Get in touch with them for a list of dealers in your area and keep an eye on their Facebook and Instagram for upcoming ride days as they roll around the country.